Dr Paul Lam Hour for hour, tai chi is probably the most effective exercise for your entire wellbeing. You can start and continue to progress to higher level no matter your age or physical condition. It is so enjoyable that millions of people around the world are practicing it. Hour for hour, tai chi is one of the most effective exercises to improve health and wellbeing. You can start and continue to progress to higher level no matter your age or physical condition. More importantly, tai chi helps you to know yourself better and like yourself more. It is so enjoyable that millions of people around the world are practicing it. Tai chi was created based on nature and harmony. The gentle flowing movements contain inner power that strengthens the body, improves mental balance and brings better health and harmony to people’s lives. Nowadays, tai chi is practised in every corner of the world for health improvement. And for good reasons. Scientific studies show that tai chi improves and possibly prevents chronic conditions such as arthritis, heart disease and diabetes. In addition, it improves balance, immunity and reduces stress. In fact, tai chi improves practically any aspect of health. There are many forms of tai chi, and it is important for beginners to find a form that they enjoy and that can bring them the benefit they are looking for. 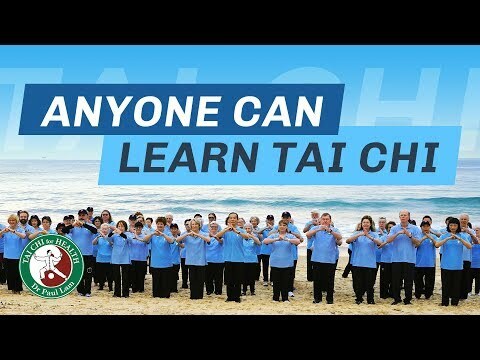 Dr Lam’s teach-yourself DVDs of his Tai Chi for Health programs have incorporated his 30 years of teaching experience to make it easy and fun to learn and, at the same time, deliver significant health benefits. Cardio-vascular fitness Cardio-vascular fitness means better heart-lung capacity. A good supply of blood and oxygen is essential for maintaining your health and for healing any disease. Strengthening By strengthening our muscles, we keep our joints stable and protected. Of course, we need our muscles to move and when we move, the muscles pump fluid and blood throughout the body, improving the functions not only of the organs and joints but also the entire body. Flexibility Flexibility improves our range of motion, making us more functional. Being flexible keeps our joints, muscles – our entire body – healthy and allows us to be more active. Jim, a 56-year-old retired fireman, is a good example of how tai chi can improve flexibility. Because of an on-the-job injury, Jim couldn’t lift his arms any higher than his shoulders. Otherwise healthy, he experienced ongoing frustration. He couldn’t reach up to cupboards; he couldn’t paint his house; he couldn’t even reach a book on a shelf above his head. Jim had given up hope of ever returning to normal. Then, simply to get exercise, he took up tai chi. Within six months, normal flexibility had returned to his shoulder joints. His life changed. He could reach. Stress You don’t have to have sustained an injury to benefit from tai chi-produced relaxation. Tai chi simply offers a tool to help you cope with busy, modern-day life by appreciating the tranquillity and the nature around you. Spirit In this context, the term “spirit” refers to simply feeling good and positive rather than “spirit” in the sense of religious or occult. For instance, “Hey, today I’m in good spirits.” Or, “Today I’m happy.” It’s usually not easy to control your mood or your spirit with your conscious mind. If it were easy, depression wouldn’t be so common, nor would it be so hard for doctors to treat. The spirit and mood is largely controlled by the subconscious mind, which has an immense power to control us. For instance, you know you’re depressed, and although you dislike the condition, you can’t seem to get out of this mental state. Reference: “The Effects of Sun-style Tai Chi Exercise on Physical Fitness and Fall Prevention in Fall-prone Adults” Dr Choi J.H., Moon J.S. and Song R., Journal of Advanced Nursing (2005).